A Team Ellie Simpson (Captain), Laylan Donachie (Vice Captain), Brooke Thompson, Carlton Ransom, McKenzie Gill, Jo Walsh, Oliver Mizsei, Jermain Mwa, Annie-Mai Brown, Kyle McGahan. Team, Gabriella Place (Vice Captain) , Ellie Simpson , Layla Walsh (Captain), Ruby Lee, Mia Zhang, Michelle Zhang, Lexi Robley, Fatima Fatty, Annie-Mai Brown, Sharlotte Gibson, Aderinsola Anifowose. Team, Alfie Noble, Freddie Willans, Byron Young-Hudson, Alex Cotterill-Stephens, Abdur-Rahman Diallo, Hassan Diallo, Emmanuel Anifowose, Abdur-Rehman Nasir, Clayton Storey, David Aghedo. 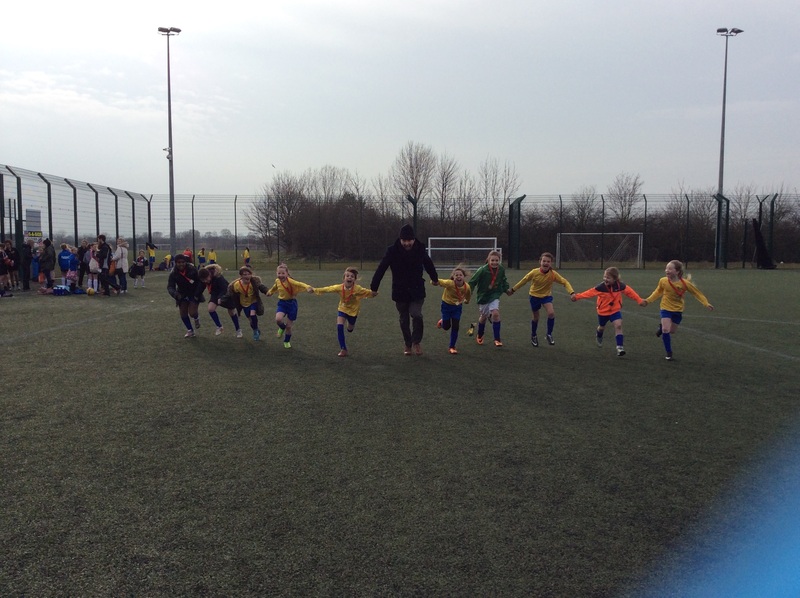 Team, Gabriella Place , Ellie Simpson (Vice Captain), Layla Walsh (Captain), Ruby Lee, Mia Zhang, Michelle Zhang, Lexi Robley, Fatima Fatty, Annie-Mai Brown, Sharlotte Gibson, Aderinsola Anifowose. Team, Alfie Noble, Freddie Willans, Tillie Broderick, Emmanuel Anifowose, Layla Newman, Datuna Shengelia. Clayton Storey, David Aghedo, Abdur-Rehman Nasir,, Kajatu Jalloh, Osman Mohamed, Joseph Mccready, Lewis Linton, Corey Vickers. Team, Gabriella Place (Captain), Ellie Simpson (Vice Captain), Layla Walsh, Ruby Lee, Mia Zhang, Michelle Zhang, Lexi Robley, Fatima Fatty, Brooke Thompson, Annie-Mai Brown. A Team, Alpha Diallo (Captain), Gideon Oyuko (Vice Captain), Aiden Binks, Bailey Ions, Brandon Ions, Laylan Donachie, Ellie Simpson, Brooklin Rymer, Gabriella Place, Connor Thompson, Jermain Mwa. A Team, Brandon Bowes-Leanard, Anthony Robinson, Cieran Broady (Captain), Owen Francis, Felix Chicuza (Vice Captain), Gideon Oyuko, Alpha Diallo, Toby Cook, Liam Walsh, Gabriella Place. Tigers, Bailey Ions (Vice Captain),Brooklyn Rymer, Brandon Ions, Marcos Pazito Kituco, Dylan Donaldson , Aiden Binks, Lewis Woodcock, Grace O’Connor (Captain) , Laylan Donachie, Libby Ford. A Team, Brandon Bowes-Leanard, Anthony Robinson, Cieran Broady (Captain), David Hey, Owen Francis, Felix Chicuza (Vice Captain), Gideon Oyuko, Alpha Diallo, Toby Cook, Liam Walsh. Girls, Skye Canham (Captain), Grace O’Connor (Vice Captain), Ruby Lee, Majula Jalloh, Libby Ford, Gabriella Place, Michelle Zhang, Mia Zhang, Millie Paterson, Chloe James. Year 5/6 Brandon Bowes-Leanard, Anthony Robinson, Cieran Broady (Captain), David Hey, Owen Francis, Felix Chikuza (Vice Captain), Gideon Oyuko, Alpha Diallo, Skye Canham. Year 1/2 Jermain Mwa (Captain), Archie Cogan (Vice Captain), Rhys Milton, Marley Walsh, Hayden Hayle, Alfie Noble, Ahmad Diallo, Sophie Vickers, Cobi Nutley. A Team, Brandon Bowes-Leanard, Anthony Robinson, Cieran Broady (Captain), David Hey, Owen Francis, Felix Chicuza (Vice Captain), Gideon Oyuko, Alpha Diallo, Skye Canham. 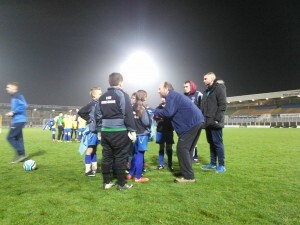 Tigers, Bailey Ions, Grace O’Connor (Vice Captain), Brooklyn Rymer, Liam Walsh, Toby Cook (Captain), Marcos Pazito Kituco, Gabriella Place, Aiden Binks, Lewis Woodcock, Libby Ford. Team, Brandon Bowes-Leanard, Anthony Robinson, Cieran Braody (Captain), David Hey, Owen Francis, Felix Chicuza (Vice Captain), Gideon Oyuko, Alpha Diallo, Skye Canham, Marcos Pazito Kituco. Team, Brandon Bowes-Leanard, Anthony Robinson, Cieran Braody (Captain), David Hey, Owen Francis, Felix Chicuza (Vice Captain), Gideon Oyuko, Alpha Diallo, Skye Canham. Team, Skye Canham, Cieran Broady, Michelle Zhang, Gabriella Place, Gideon Oyuko, Caitlin Bowes-Leonard, Ellie Simpson. A Team, Brandon Bowes-Leanard, Liam Walsh, Cieran Braody (Captain), David Hey, Owen Francis, Felix Chicuza (Vice Captain), Gideon Oyuko, Alpha Diallo, Skye Canham, Gabriella Place. Tigers, Bailey Ions, Grace O’Connor (Vice Captain), Brooklyn Rymer, Josh Jefferson, Anthony Robinson, Dylan Donaldson, Toby Cook (Captain), Callan Parry, Marcos Pazito Kituco, David Bryson. Jenson Urwin (GK), Alpha Diallo (C), Gabriella Place (VC), Brandon Ions, Connor Thompson, Ellie Simpson, Ryan Grey. Subs: Bailey Ions, Kyle Handley, Josh Jefferson, Brooklyn Rymer. Brooke Thompson, Cieron Huddlestone,Tommy Leadbitter, Annie-Mai (Captain), Ellie Simpson (Vice Captain), Jensen Irwin, Ryan Grey. Congratulations to the team in reaching the finals! 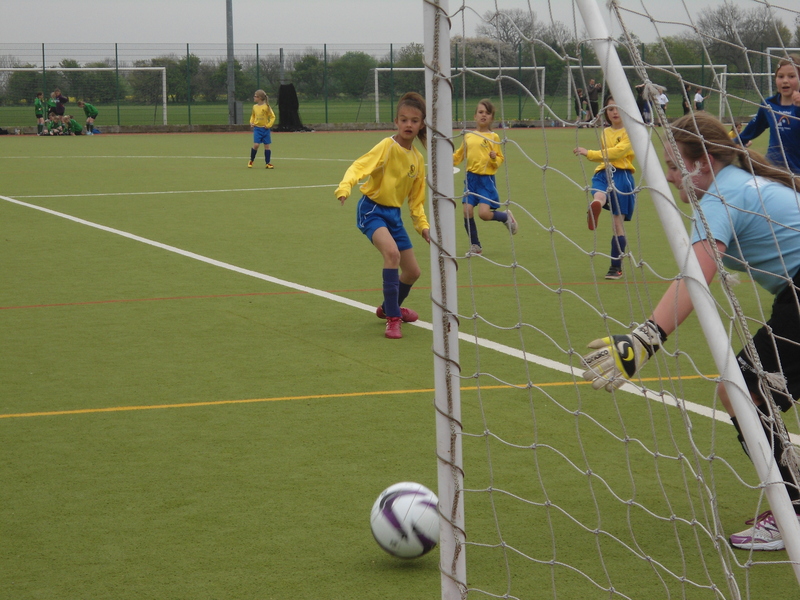 The girls played superbly well in the Stockton Schools Competition; winning the tournament without defeat. Unprecedented success in five a side football this term, has culminated in the Year 5/6 team winning the Teesside Football League trophy making them the best side (for their age) in Stockton and Hartlepool. They will now be going on to the North of England stage, to be held next year in Morecombe, and battle for a chance to play at Wembley. However, the excitement of competing on a professional football field is yet to wear off. Playing at Hartlepool United’s Victoria Park, after the home team were beaten 4 – 1 by York City, Tilery’s tenacious tykes set about giving their supporters something sensational to cheer – alongside the moment ‘Angus’ the monkey stole Mr Cliff’s hat. Within minutes of taking to the field, our heroes took the lead and the 40 strong Tilery support were on their feet! A beautiful ball was played by Captain Fantastic Ben Heeley to the suave, stylish winger Anthony Bradshaw who cut infield to finely place his shot past the despairing keeper. “It was a great ball by Ben” said Anthony. It was end to end stuff with both teams applying pressure on their opponent’s goal mouth, however, the Tilery crowd acted as an extra team mate through constant cheering and song led by the unique voice of Mrs Middleton. “Singing in tune is overrated,” stated one generous onlooker. The Tilery Match Day Squad: Shane Rowbotham, Amie James, Scott Hamilton, Musa Fatty, Nikita Thompson, Anthony Bradshaw, Abdullah Nawrouse, Ben Heely. 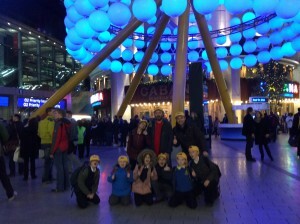 Another first for Tilery’s sports crazy kids was a trip to the O2 Arena, London to watch the ATP Tennis semi-finals. The lucky chosen few (Ben Heeley, Libby Hutchinson, Amy James, Dylan Grey, Scott Hamilton and Liam Higgins accompanied by Mr Repton, Mrs Keating and Mr Cliff) took their seats in the resplendent venue, refined in splashes of blue hues from the overhead lights, to watch Spaniard David Ferrer take on Kei Nishikori of Japan. Ferrer took the first set but the Japanese came storming back to win the match 2 sets to 1. 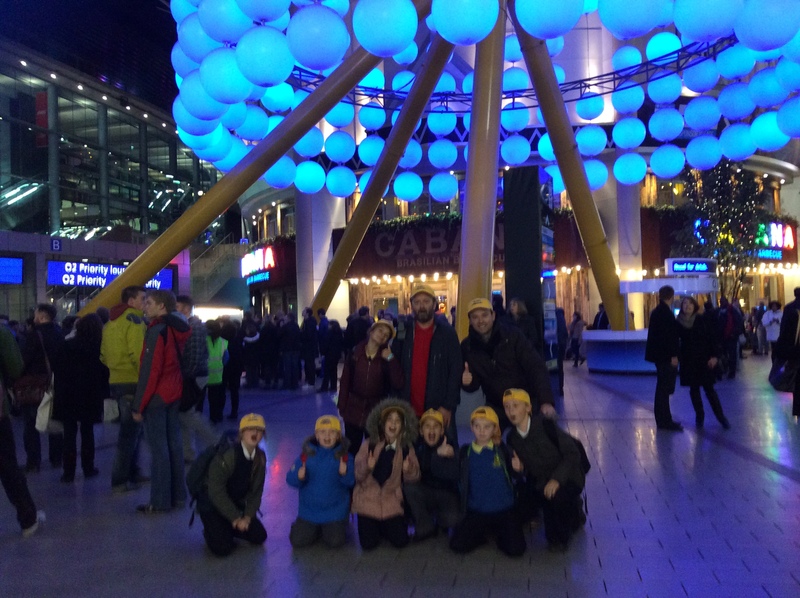 The Tilery school children were thrilled by the spectacle and enjoyed the pulsating affair. Heart beats were further quickened by a trip over the Thames using the Emirates Airline Cable Car, providing stunning views of the capital. A quick bite to eat was proceeded by a smooth journey home by train, although for one pupil (who shall remain nameless) the excitement was far from over, after locking himself in the loo! Fortunately, a friendly guard unlocked the door and set our relieved pupil free, who was in turn greeted by cheers from his fellow passengers. Tilery Primary School will be playing football against Coatham Primary School, Redcar, this Friday 28th November . We will be traveling to Redcar and the Kick Off will be at 1.45.